Don’t let higher interest rates, the Time Warner deal, debt concerns, or wireless losses scare you into selling this solid income stock. This article was originally published on Nov. 21, 2016, and updated on April 18, 2017. AT&T (NYSE:T) surged to a historic high of $43 in July 2016, fueled by robust demand for dividend stocks and its cash-flow-boosting purchase of DirecTV. Since hitting that peak, AT&T stock has pulled back to around $40 on various concerns about its future. But as a long-term AT&T investor, I believe that many of those concerns are overblown. Let's examine four common bearish arguments against AT&T, and why I believe that they're terrible reasons to sell this solid income stock. Many high-yield dividend stocks, including AT&T, outperformed the S&P 500 over the past 12 months as low interest rates sent investors scrambling for higher-yield investments. But as interest rates inevitably rise again, income stocks like AT&T will become less attractive than the guaranteed returns of bonds. However, AT&T currently trades at 19 times earnings, compared to the industry average of 22 for domestic wireless telcos. Furthermore, the benchmark 10-year Treasury yield of 2.2% remains much lower than AT&T's forward yield of 4.9%. When AT&T announced in October 2016 that it would buy Time Warner (NYSE:TWX.DL) for over $85 billion, bears warned that the acquisition could be as disastrous as the AOL-Time Warner merger in 2000, which resulted in a $99 billion write-off just two years later. However, buying Time Warner will help AT&T counter the expansion of younger tech companies into its backyard. For example, Netflix's growth convinced many consumers to dump their bundled pay TV subscriptions for cheaper broadband-only plans. To address that demand, Alphabet's Google then launched its Fiber wireline service, Google Fi wireless service, and Google Station Wi-Fi service. Those streaming and broadband services all threaten AT&T's position as a leading ISP and pay TV provider. However, buying Time Warner will give AT&T the power to bundle the latter's media assets (like HBO) with DirecTV, which is already bundled with its unlimited wireless data plans. It could also offer "data-free" streaming of those first-party services for its wireline and wireless customers. Other companies, like Netflix, still have to pay AT&T for data-free streaming. In February 2015, credit rating agency Moody's downgraded AT&T's senior unsecured notes rating following its $18.2 billion purchase of AWS-3 spectrum licenses and its $49 billion purchase of DirecTV. Last October, Moody's issued another downgrade warning after the Time Warner deal was announced. Moody's warned that AT&T's rising debt levels following the deal -- which would boost its adjusted gross leverage from about 2.8 times today to 3.5 times -- could eventually force AT&T to reduce its dividends. 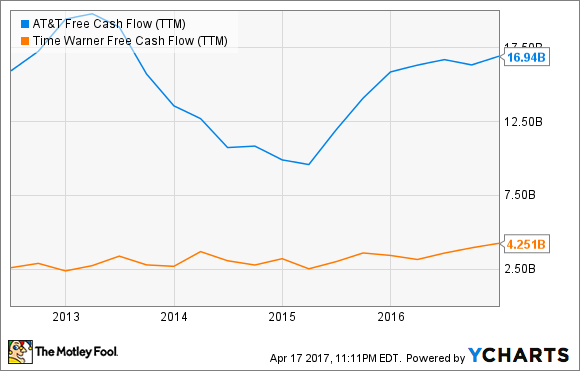 However, AT&T is very unlikely to cut that dividend -- which it's hiked annually for over 30 years to become an elite Dividend Aristocrat -- unless its free cash flow completely dries up. That scenario seems unlikely if we look at AT&T's and Time Warner's FCF growth over the past five years. AT&T bears often note that demand for the company's postpaid smartphone subscriptions is peaking in the U.S. However, they often ignore its wireless growth in the prepaid market with Cricket and its growing user base in Mexico. They also overlook its "other" connected devices, which include connected vehicles, which require better stand-alone connections for their infotainment and navigation systems; and autonomous drones, which can fly across AT&T's 4G networks. In January 2016, AT&T announced that it would offer stand-alone connections to 10 million Ford vehicles in North America by 2020. The following month, it tested out the world's first LTE-connected drones with Intel. Growth in these adjacent markets -- coupled with its growth in the prepaid and Mexican businesses -- should prop up its wireless business even as its U.S. smartphone subscription rates decline. I'm not saying that AT&T has a flawless business strategy, but I believe that the specific fears about higher interest rates, Time Warner, its debt levels, and wireless "losses" aren't compelling reasons to sell the stock. Instead, investors should focus on the fact that AT&T is trading at a steep discount to the industry while offering a hefty dividend yield which is more than double the S&P 500's average yield of 2%. Therefore, I personally plan to tune out the noise and stick with my original plan of holding AT&T for the long term.